Louise D'Arcy • "Hear That Sound"
Got a YouTube video of your original song? Send us your link! 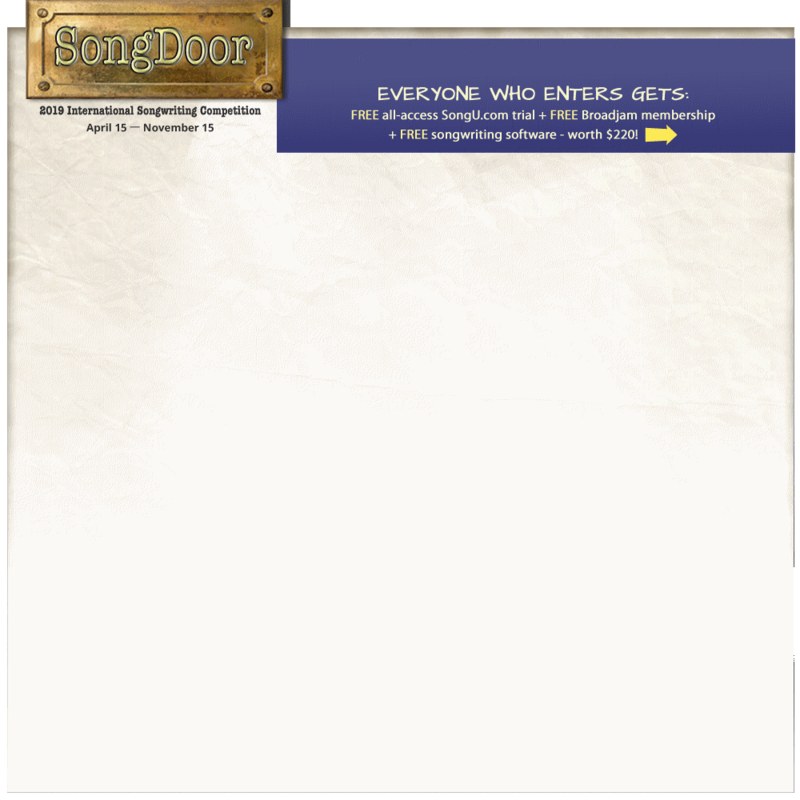 SongDoor is an annual worldwide songwriting competition that's open to amateurs and professionals, ages 16 and older. We are here to help you do two things: first, get your music heard by industry pros who have influence and connections. Second, help you be a better songwriter. We give you 3 FREE songwriting tools ($220 worth) just for entering. No other competition does that because no other competition cares about their writers like we do. Here's the proof. We also have the lowest entry fee ($10), by far. That's about a third of most other contests. It's been $10 since we started in 2006. News for 2019: We are switching out the acoustic guitar award in favor of a $1,000 cash award, which many of you have asked for. Other newsbits: We're currently working on a complete overhaul of the website, which will make it easier to see on your phone. And while the entry fee stays the same as it has for 13 years, the entry evaluation price has increased to $15. The demand is very high for these, and we were faced with hiring more staff just for the evaluations — which would have raised the entry price. We didn't want to do that, and we didn't think you wanted us to do that, either. Lots of exciting stuff in store for this year. We're always here to support you, answer questions and give advice. Just ask.